Welcome to Franklin Levinson's Horse Help Center, where he answers questions regarding horse behavior and solves specific issues with individual horses. The Help Center database currently contains 889 separate questions posed by equestrians, trainers, and horse lovers, along with Franklin's responses. The tremendously positive feedback from folks who have been helped by this service is a tribute to the effectiveness of Franklin’s methods, even through an email. Below are the most recent additions to our database. Should you not find an answer to your horse-related question within these files, you may contact Franklin. Aggressive horse in my care. Arabian mare forges ahead and is spooky to ride. Tennessee Walker tosses his head a lot. y horse is a Tennessee Walker...My problem is she throws her head when riding. Almost rearing up. I broke my back falling off her when she did it last fall. She continues to toss her head when riding and sometimes lunging. . Horse is fine in the arena but scared when hacking out. How to treat a grieving mare?. I found your web page while trying to find info on how to comfort my grieving 23 year old mare who lost her 23 year old best friend...this one is the apple of my eye. I don�t want to surrender her to a broken heart if I can help her. I have a little bay gelding that I have had since he was born. He wasn't gelded late, and he's never shown aggression before. Ever since he went up to dad's house he started acting up. ...He has never lunged at anyone. Now he has bitten mom, dad, Bammy, papa, and a friend. It's not okay and I don't know what to do..
Franklin gives new horse owners valuable advice about feeding, exercising, discipline, and basic qualities necessary to be an effective leader..
Corfu, Greece: Gaining knowledge of, and proficiency with, horses should be considered a life-long endeavor. However, with the exclusive and private/semi-private nature of the Elegant Horsemanship Programs led by Franklin Levinson and his wife Ilona, a higher level of efficiency with the training and advancement of the student is a far greater possibility. Programs are individually designed to suit the needs and desires of the participants. 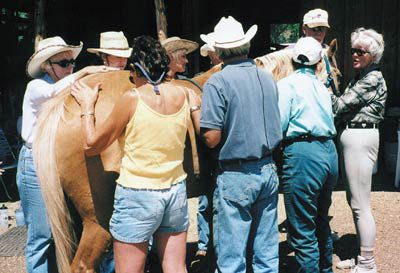 Participants can bring in their own horses or use those available at the facility (boarding is available).